Feeling largely ignored by last year's Baja to Vancouver show, Portland artists collaborated last October to create Core Sample, a 10 day artist-run collection of more than two dozen exhibitions throughout the city. Venues were borrowed or created, volunteers were assembled, favors were cashed in and Portland artists were on display like never before. Almost a year later, Core Sample: Portland Art Now documents the resulting chaotic beauty with photographs, essays and a DVD. Randomly flipping through the catalog, one passes through mediums and themes with seizure-inducing speed--the hypnotic narrative painting of Horia Boboia, Chandra Bocci's consumer packaging explosions and Patrick Long's drawings of police in love. Those who fanatically visited every Core Sample venue will remember slowly opening the wolf-infested refrigerators of Vanessa Renwick's "Hunting Requires Optimism," or wondering if the fragile text of Pablo de Ocampo's "Recollections, Affirmations and Requests" would simply blow away. Many will discover work for the first time, within the explanatory writings and photographs piecing the book together with the help of a built-in bookmark. The catalog's commissioned essays provide interesting, sometimes provocative insight. 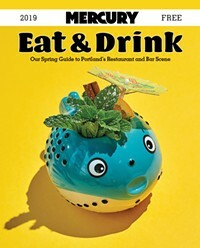 Written by critics who do not call Portland home, some of the comments, such as Cecilia Dougherty's comparison of Portland to "Tempe, Arizona, during the Ford-era recession," will raise a few local eyebrows. Others ring surprisingly true. Novelist Lynn Tillman asks questions that remain unanswered: Will this be the start of something important, a legend of Portland ingenuity and determination? Or will it slowly recede into the annals of false optimism? Informative and cute as a button, this Clear Cut Press publication offers a new look at a spectacular, somewhat flawed experiment--one that by-passed institutional hierarchy in favor of unprecedented DIY participation. You'll find yourself a willing prisoner of Core Sample's charms, unable to escape the endless cycle of flipping from pictures to essays and back again.